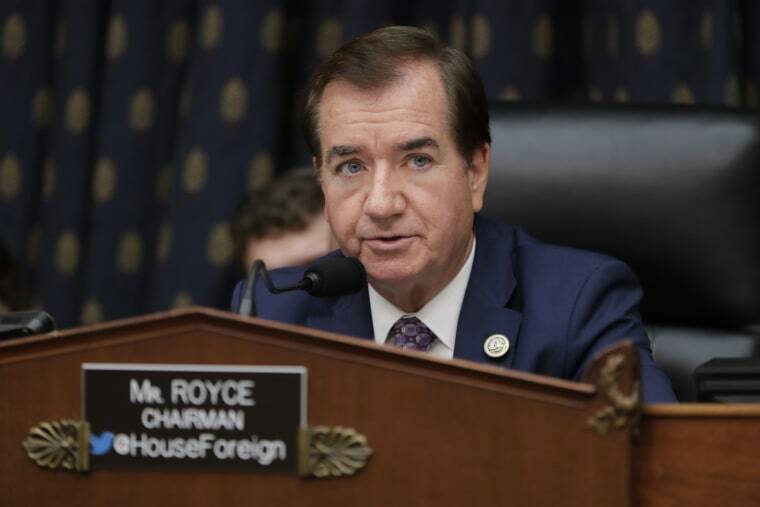 Rep. Ed Royce is asking the president for new sanctions on Russia for attack in Britain. WASHINGTON — The Republican chairman of the House Foreign Affairs Committee is chastising President Donald Trump for ignoring a deadline to decide whether Russia should face sanctions for the poisoning of a former Russian spy in Britain with a military-grade nerve agent. The chairman, Rep. Ed Royce, R-Calif., in a letter to Trump on Thursday that was obtained by NBC News, said Trump’s enforcement of existing sanctions that punish chemical weapons users “is critical to deterring additional attacks.” He said Trump’s administration had already blown through the statutory deadline by more than a month, and gave the president a new deadline of two weeks to tell Congress of his decision. The White House National Security Council declined to comment, saying it does not discuss correspondence between the president and Congress. The criticism from Royce comes as Trump’s fellow Republicans are increasingly willing to publicly question his decision-making on foreign policy, especially when it comes to Russia. In a Senate hearing on Wednesday, Secretary of State Mike Pompeo was aggressively questioned by GOP senators who were outspoken in their frustration at how Trump handled his summit in Helsinki this month with Putin, the Russian president, and the lack of answers about what transpired in their private meeting. “It appears that in a ‘ready, fire, aim’ fashion, the White House is waking up every morning and making it up as they go,” Tennessee Sen. Bob Corker, the Republican chairman of the Senate’s foreign relations panel, told Pompeo. Royce, who is retiring, is seeking to force Trump to make a determination of whether Russia violated international law prohibiting the use of chemical weapons by allegedly poisoning ex-spy Sergei Skripal and his daughter with the nerve agent Novichok. Moscow has adamantly denied involvement, even as concern grows after two additional people in Salisbury, England, were poisoned in a nerve agent attack that police believer is linked. One of them died. On March 15, Royce wrote to Trump asking him to determine whether Russia had violated the Chemical and Biological Weapons and Warfare Elimination Act of 1991 “and apply sanctions as appropriate.” Under the law, that letter from the Foreign Relations chairman triggers a 60-day deadline by which the president is statutorily required to make a determination about whether Russia violated international law by using chemical weapons abroad. If the president decides Moscow did, an initial round of sanctions against Russia would immediately kick in. It’s unclear what effect those would have because many of the activities that would be prohibited — such as selling arms to Russia — are already banned under other sanctions punishing the Kremlin for other behavior. But three months after those initial sanctions, Russia would get hit with far more comprehensive sanctions unless Trump determined that Russia had stopped using chemical weapons and “provided reliable assurances” that it wouldn’t use them again, including letting U.N. observers into Russia to inspect. That second round of sanctions would hit Russia’s imports and exports, and would also bar Russian-controlled airlines from flying to or from the U.S.
Royce’s letter comes amid continuing fallout for Trump from his widely panned summit with Putin, in which the president appeared to side with the Russian leader over American intelligence agencies about whether Russia meddled in the 2016 presidential election. Trump further stunned Russia hawks last week by inviting Putin to Washington for a second summit, but the White House said on Wednesday that the meeting would be postponed until next year.